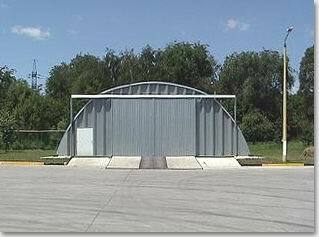 Since 1995, our enterprise delivers and mounts arch buildings (hangars) of WSB type made of the galvanized steel and manufactured in Dnipropetrovs’k (Ukraine). To produce and complete those buildings we use apply galvanized steel "EKOZINC" of "EKO Stahl GmbH" – Germany. Since 2004, we represent new arch buildings designs of SSB type at the Ukrainian market.Structures are made of the galvanized steel "ALUZINC" with improved corrosion resistance. We supply three types of buildings - "P", "Q" and "S". Buildings are of universal purpose - from a warehouse and a corn house, up to premises for accommodation of manufacturing or garage and from a mass sports construction up to trade and exhibition center. Delivery of structures is performed in the shortest possible terms. Buildings assembly is carried out according to the license - series АА, # 396500. Assembly periods are minimal - a crew of FIVE mounts a building of dimensions of 15 x 30 meters in 15 days without application of lifting devices. Delivery of structures is carried out by motor transport. We work throughout UKRAINE and for EXPORT. We GARRANTEE European level of quality and keeping of delivery dates. We shall be glad to answer all YOUR questions, and we are ready to mutually advantageous cooperation. With the best regards – collective of PKP STROIEX.